WhatsApp, which has maintained a slow and steady approach in what features it wants on its app, , has been aggressively adding new features to its platform lately. Earlier this month, it introducedvideo calling capability. It is also testing a Snapchat Stories like feature. 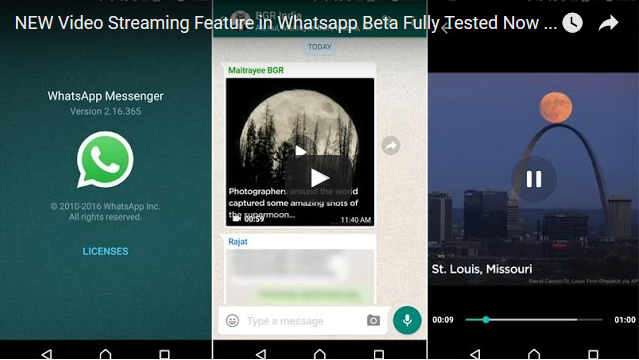 Today, WhatsApphas begun rolling out a new feature that can improve your video watching experience on its platform. WhatsApp no longer requires users to finish downloading a video for them to begin watching it. Much like YouTube, and many other streaming service, the video can now be streamed as it being downloaded. Initially, users could only view a video shared with them after it was fully downloaded. Now, WhatsApp has replaced the download button with play button that will allow users to stream video while it is still buffering. This feature is currently available to WhatsApp beta users on Android, with time it will be rolled out to main WhatsApp.